The family of an Asian man who was stabbed to death in North Lanarkshire 13 years ago have called for his killers to be brought to justice. 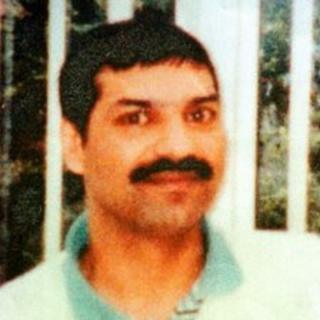 Surjit Singh Chhokar was murdered in Overtown on 4 November 1998. His sister Manjit Sangha said she hoped changes to Scotland's double jeopardy law would mean that the murder investigation could be reopened. Ms Sangha was speaking publicly about the case at a news conference at the Scottish Parliament. Her brother's murder sparked controversy after prosecutors failed to bring anyone to justice. Two official inquiries were ordered in the wake of the original legal episode. One made allegations of "institutional racism". The case has been compared to the Stephen Lawrence inquiry in London, which earlier this month resulted in two convictions 18 years after the teenager's murder. Speaking at a new conference at Holyrood, Ms Sangha said: "People will have forgotten Surjit's name, yet the darkness of his murder still shadows our lives. "All that we have ever asked for is justice. The recent changes in the law once again gave us hope. "I am extremely sad that my father, Darshan Singh Chhokar, cannot be by my side today. "This is because he is extremely ill with cancer, but his last wish is that justice can be done. "We are not here to start a campaign again but my family simply want the Lord Advocate to bring Surjit's killers to court and give us justice." Earlier, it was confirmed that Lord Advocate Frank Mulholland will meet with the Chhokar family on 26 January to discuss reopening the case. The family's solicitor, Aamer Anwar, told the news conference that Mr Chhokar's killers should not rest easily in their beds. "Surjit's family never wanted him to be Scotland's Stephen Lawrence, but once again killers were left free to roam the streets. "A hope for justice is all the Chhokar family live for." Mr Anwar said the legal reform, and the recent conviction of two men for the Lawrence murder, had rekindled that hope. He called for an immediate review of the Chhokar case, with the three previous suspects re-interviewed. Evidence at the last trial, he said, should be reviewed and new forensic skills should be used. He also appealed for any member of the public to come forward with new information. "Just as in the Stephen Lawrence case, the killers of Surjit Singh Chhokar should not rest easy in their beds," he said. "The family have no desire to re-start the campaign, and trust the Crown Office will be determined to secure justice for the Chhokar family, if at all possible, so that Surjit Singh Chhokar can finally rest in peace." The news conference was also attended by Labour MSP Graeme Pearson, who has previously called for the Chhokar case to be re-investigated. Mr Pearson was head of crime at Strathclyde Police when the waiter was murdered. He said: "The murder of Mr Chhokar is unfinished business. There's no doubt that the unsatisfactory conclusion of the trials 13 years ago has left a bad taste in everybody's mouth. "The introduction of new legislation which allows double jeopardy and the reconsideration of cases such as the Chhokar case is a breath of fresh air to the legal system and offers an opportunity for the Crown to address a number of cases which lie in the system which need to be resolved. "I think Surjit Singh Chhokar is one of those cases." Humza Yousaf, an SNP MSP and member of Holyrood's Justice Committee, who organised the news conference, said: "I think there has been a change of attitude this time around, be it from the Crown Office or others. "People want this case resolved from all sides."